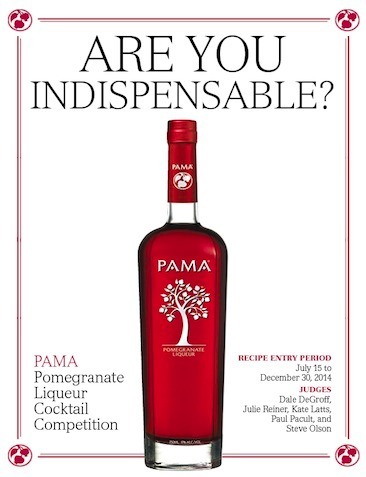 PAMA, the original, all-natural pomegranate liqueur, announces the second annual “Are You Indispensable?” Cocktail Competition for professional bartenders and mixologists age 21+. The competition, hosted by Hanna Lee Communications, Inc., spotlights PAMA’s role as the indispensable modifier that harmonizes an infinite array of base spirits, both clear and aged, and cocktail ingredients in drinks for every occasion and season. With its balanced sweet-tart flavor, silky texture and ruby-red color, PAMA brings complexity and sophistication to cocktails ranging from aperitifs to nightcaps. Six finalists will be chosen to compete in New York City. The grand prize is $5,000, with second and third place winners awarded $2,000 and $1,000 prizes respectively. A maximum of two (2) recipes, including cocktail names, list of ingredients, preparation method, inspiration behind each cocktail and cocktail photos should be uploaded at www.shakestir.com/PAMA. Heaven Hill Distilleries, Inc. will assume ownership of all the submitted recipes and will credit its creator in all publicity (print, broadcast, online), social media platforms, as well as marketing materials. The competition is organized and hosted by Hanna Lee Communications, Inc.
ShakeStir, a leading online community for bartenders and mixologists.